• Domestic activities such as spinning, weaving, knitting, carding, brewing, distilling, baking, dairy work, cleaning, washing, cooking, and food preservation such as salting meats. • The extent to which the country underwent an ‘industrious revolution’. • Critiques of the literature/applicability of the concept ‘proto-industrialisation’. • Gendered and age-related dynamics of domestic work. • Time management and the seasonality of domestic production. • The relationship between domestic production and the industrial revolution. • Urban, rural, regional and other geographical differences in domestic production. • The productivity of various types of domestic work. • The uses of home-produced goods (e.g. for personal use, commercial use etc). Proposals should comprise a 300-word abstract and a biography. 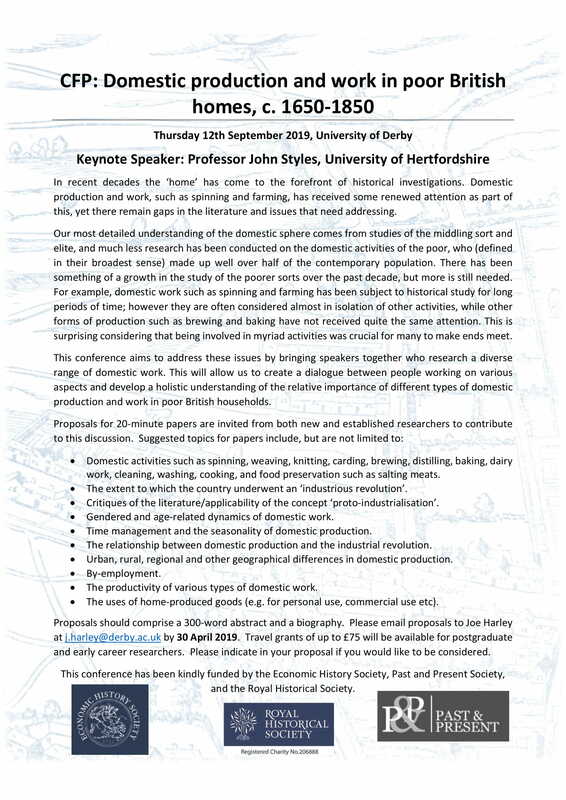 Please email proposals to Joe Harley at j.harley@derby.ac.uk by 30 April 2019. Travel grants of up to £75 will be available for postgraduate and early career researchers. Please indicate in your proposal if you would like to be considered.